On Thursday, February 1, 2018, Krannert Center announced a five-year, $30 million fundraising initiative at a donor gathering prior to a performance by world-renowned violinist Joshua Bell. To launch this endeavor, which is nested within the university’s “With Illinois” campaign, Krannert Center Director Mike Ross was joined by Lyric Theatre @ Illinois faculty members Julie and Nathan Gunn for a presentation on “The Krannert Center Effect,” which celebrated the profound and lasting impact of the Center’s 50-year history, including its support of the educational missions of and performances by the School of Music, Dance at Illinois, and Illinois Theatre. Advocates and industry colleagues have long observed that the power of the Center’s programming and its values of collaboration, innovation, excellence, and inclusivity stay with university alumni and others who propel the arts as designers, performers, and arts administrators throughout the world; with those who support art-making in their own communities; and with those who use the creativity experienced at Krannert Center to advance other disciplines. The effect also reverberates with the many visiting artists whose research and new work are supported through Urbana-based residencies and performances. In the mid-1960s, the Center’s inaugural benefactors, philanthropists Herman and Ellnora Krannert, made a $16 million commitment to excellence in the arts with a vision for the future and loyalty to the University of Illinois at Urbana-Champaign. That gift made manifest what is widely considered to be the nation’s leading university-based performing arts center. Since Krannert Center opened its doors on April 19, 1969, it has welcomed millions of people, including over 350,000 youth series attendees. Each year, the Center hosts 300+ performances, receives approximately 300,000 visitors, and interacts with over 80% of the University of Illinois student body. In 1989, Krannert Center announced the formation of its endowment fund which now represents over $20 million in holdings, providing critical interest income to support the Center’s programming. However, a large percentage of the costs required to present a full spectrum of visiting artists is not covered by the current combination of endowment income, ticket sales, student fees, and grants, leaving a sizable need to ensure the present and future of this vital cultural asset. 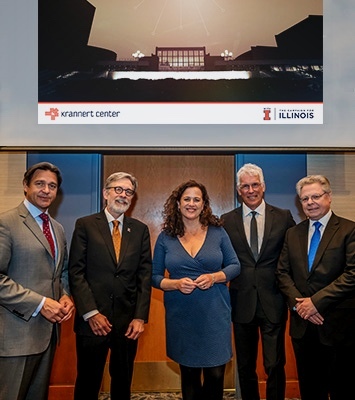 The Krannert Center “Endow the Dream” $30 million initiative, in conjunction with the University of Illinois “With Illinois” campaign, will preserve the excellence of this esteemed institution and further strengthen “The Krannert Center Effect” for future generations. Funding priorities will remain focused on visiting artist fees and programming ($15M), research and the incubation of new artistic work ($5M), education (of both arts and non-arts students) ($5M), and engagement programs and access needs ($5M). More information is available by contacting Senior Director of Development Deborah Miller at development [at] krannertcenter.illinois.edu or 217.333.1629 or Anthony Pomonis of the University of Illinois Foundation at apomonis [at] uif.uillinois.edu or 217.300.3470. With Illinois is the University of Illinois at Urbana-Champaign’s largest campaign ever, with the goal of raising $2.25 billion in gifts to support Illinois students, faculty, research, and infrastructure. Already more than half-way toward this goal, the university has received nearly $1.25 billion. With current support of hundreds of thousands of donors from all 50 states and over 100 countries, the With Illinois campaign will continue to elevate the values that make Illinois distinctive: a sense of boundless aspiration, collaborative research, and global perspective. And will continue to honor the people that have shaped the culture and character of this place: students, faculty, staff, and alumni. The world is a better place With Illinois. To learn more about the With Illinois campaign, please visit with.illinois.edu.